“One of the only breeds still bred for taste…” Our Berkshire pork, combined with lots of pasture, woods, and sunshine will have you loving pork again! 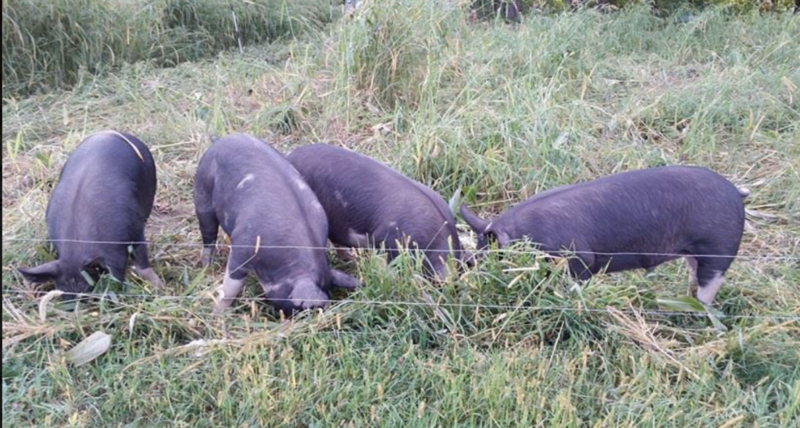 We rotationaly graze our pigs through the woods, pasture, and crop fields using portable electric fence. This puts the pigs on our team. They work the land for us! You’ll find them digging, rooting, running, eating bugs and worms, and lounging in the shade. Be confident that the pork you eat was raised right! We sell our pork by the whole and half pig. We take reservations each spring. Reservations for 2017 are currently sold out. If you’d like to be put on a waiting list, should an opening arise, please email us!